I have been wanting to try this recipe out FOREVER! Why haven’t I, you ask? Mostly because I tried actually cutting up a butternut squash once many years ago and it was terrible, my hands hurt and were orange and I don’t ever want to do it again. Ever. Because I’m a chicken. So I had to wait until I remembered to pick up already-diced butternut squash from Trader Joe’s. And, sadly, that took me forever. Butternut squash and sage is a captivating flavor combination to start with. Add in gooey mozzarella, grainy ricotta, pasta, and a hint of nutmeg? Awesome. I was pleasantly surprised by how easy it was to put together, too. 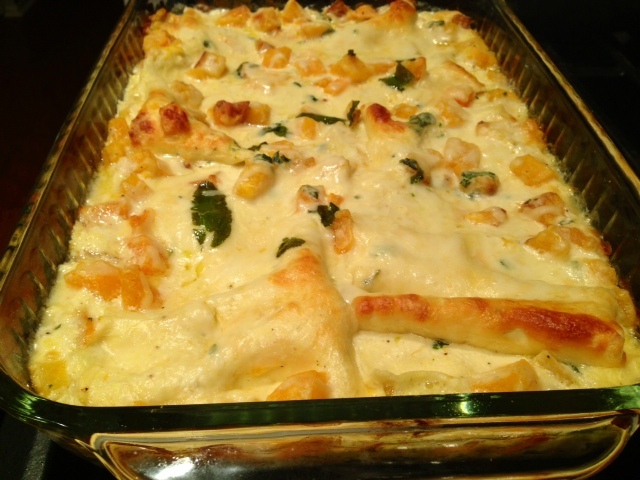 I roasted the squash a couple hours ahead of time, and the rest of the assembly was very simple—particularly since I used oven-ready lasagna noodles. While you could add chicken if you wanted (or even chicken sausage), it didn’t feel like it needed meat. It was hearty enough on its own, and would be great for a Meatless Monday type of meal plan. Pre-heat the oven to 425 F. Line a baking sheet with foil (I always do this, fewer dishes to wash!) 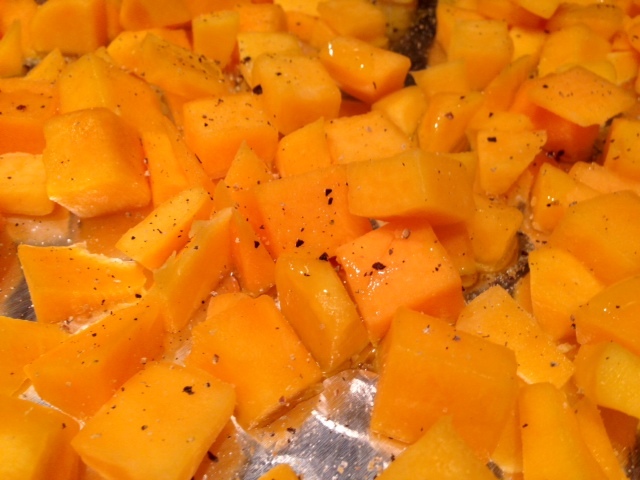 and toss the squash, oil, 1 teaspoon of salt, and some pepper together. Bake for 25-30 minutes, until they’re light gold and tender. Set them aside to cool and reduce the oven temperature to 375 F.
I used oven-ready lasagna noodles, but if you’re using regular lasagna noodles then set a large pot of water to boil, salt the boiling water, and add the lasagna noodles. Cook according to the directions, probably around 9-10 minutes. 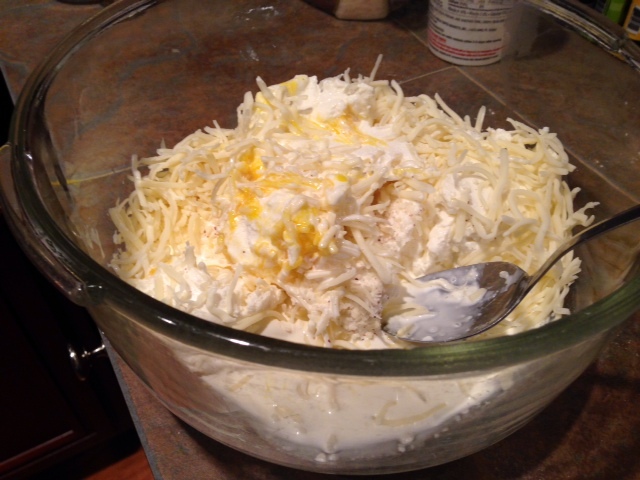 In a very large bowl, stir together the ricotta, cream, egg yolks, mozzarella, some salt, and a pinch of nutmeg. 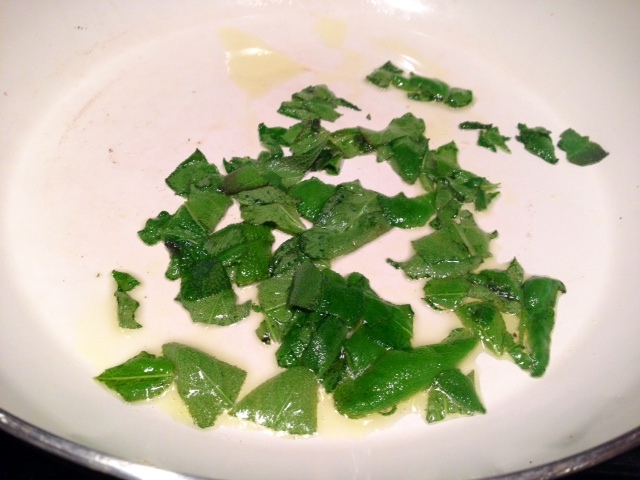 Melt butter or a little bit of oil in a small sauté pan over medium-high heat. As soon as it starts to sizzle, add the sage and cook until slightly crisp at the edges. It should only take 3-5 minutes. Remove from the heat. Add the squash to the bowl with the other filling ingredients and mash half of it with the back of a spoon, leaving the other half in whole pieces. 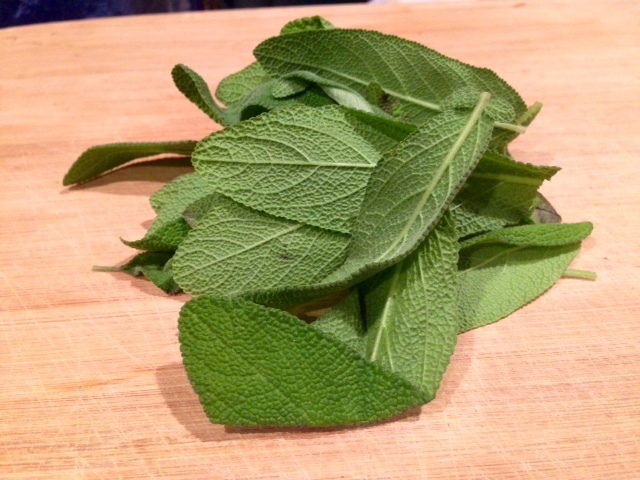 Then gently stir in the sage and butter, chicken stock, and season with salt and pepper. You get this nice…soup-like mixture. Spray a 9×13 pan with cooking spray and then spread 3/4 cup of the ricotta mixture in the bottom of the pan. 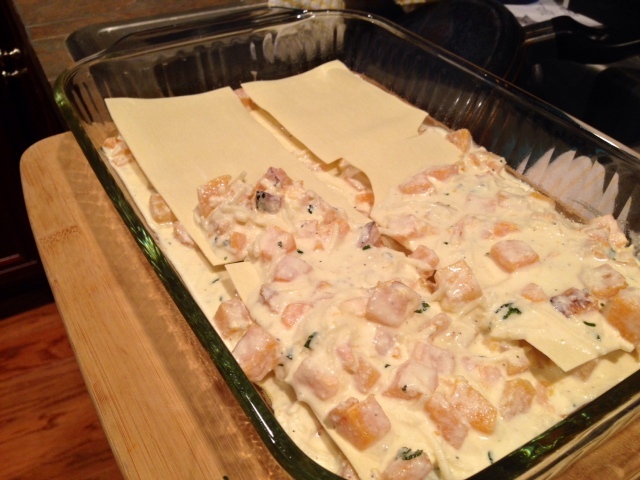 Top with a layer of the lasagna noodles. Then spread half of the filling mixture over the noodles and top with another layer of noodles. Spread 1 cup of the ricotta mixture on top of the noodles. 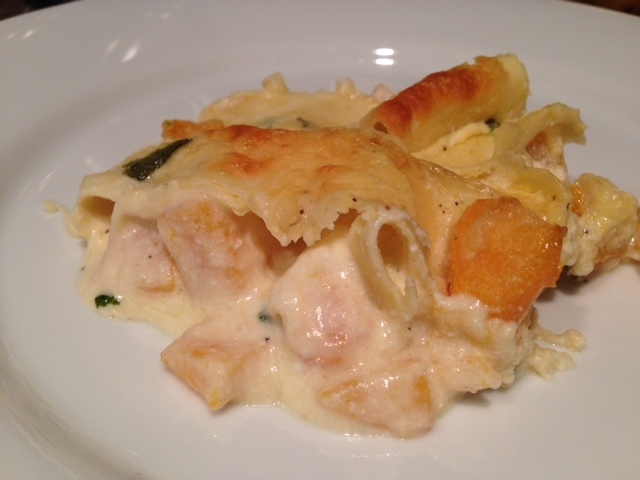 Repeat layering once more (noodles, squash, noodles, ricotta). Honestly, I don’t remember exactly how many layers I had, just do what works for you. Sprinkle Parmesan cheese over the last layer of filling. 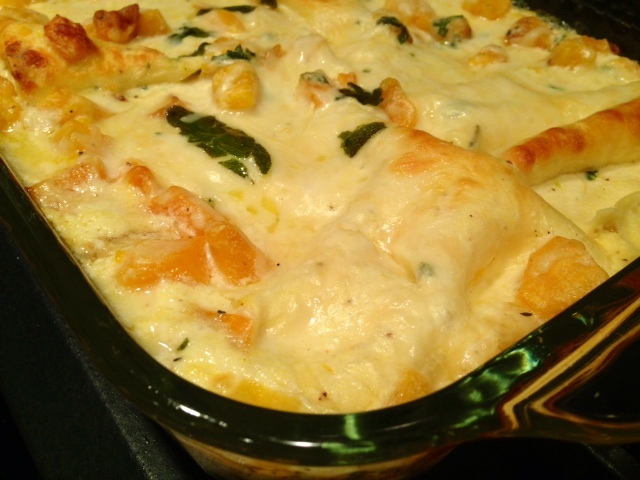 Bake until the cheese is golden and bubbly, about 30-35 minutes. Place the pan on a rimmed baking sheet if you’re afraid of stuff bubbling over in the oven. Let the lasagna sit for about 15 minutes before slicing into it. It allows everything to set and come together, otherwise it’ll fall apart and be super liquidy. Pre-heat oven to 425 F. Toss the squash, oil, 1 teaspoon of salt and some pepper on a baking sheet. Bake for 25-30 minutes, until they’re light gold and tender. Set them aside to cool and reduce the oven temperature to 375 F. If you’re using regular lasagna noodles, set a large pot of water to boil, then salt the boiling water and add the lasagna noodles. Cook according to the directions. 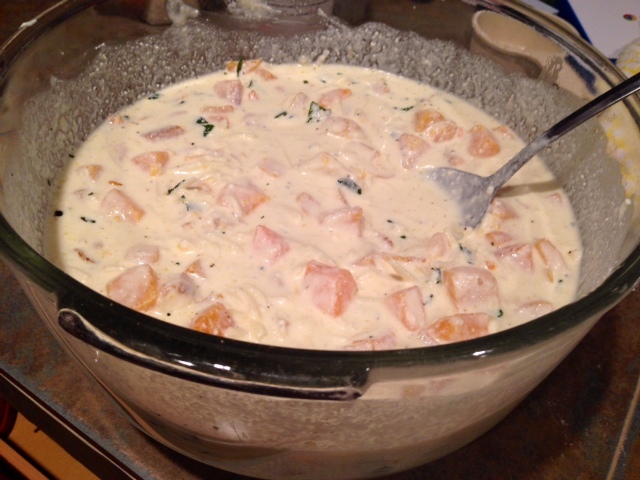 Stir together the ricotta, cream, yolks, mozzarella, and a pinch of nutmeg in a medium bowl, and season with salt. Melt butter in a small sauté pan over medium-high heat. As soon as it starts to sizzle, add the sage and cook until slightly crisp at the edges, 3-5 minutes. Add the squash to the bowl with the other ingredients and mash half of it with the back of a spoon, leaving the other half in whole pieces. Gently stir in the sage and butter, chicken stock, and season with salt and pepper. Spread 3/4 cup of the ricotta mixture in the bottom of a 9×13 pan (I greased my pan first). Top with a layer of noodles. 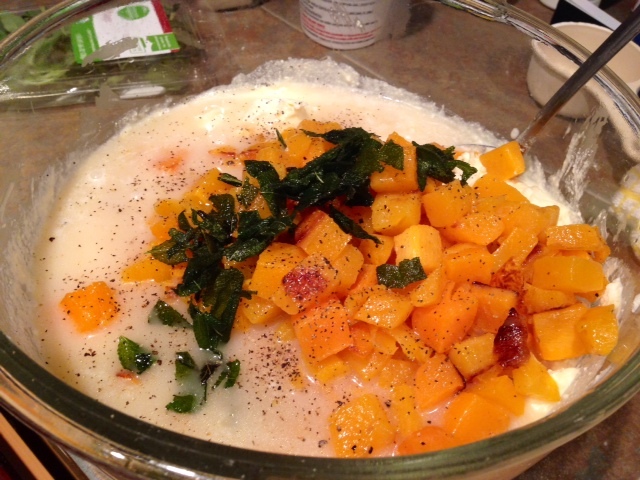 Spread half of the butternut squash mixture over the noodles. Top with another layer of noodles. Spread 1 cup of the ricotta mixture on top of the noodles. 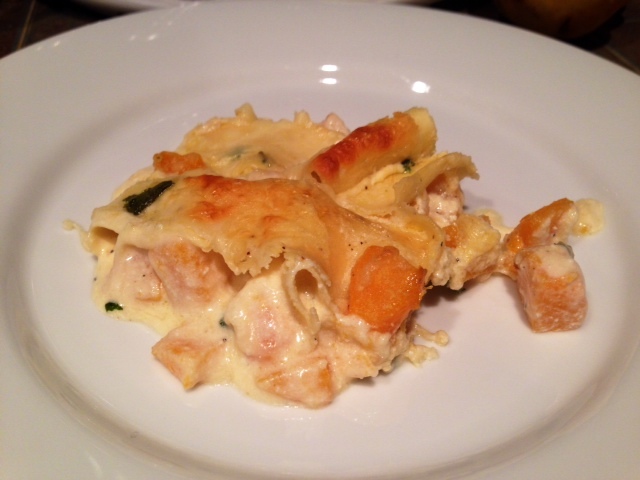 Repeat layering once more (noodles, squash, noodles, ricotta). Sprinkle Parmesan cheese over the ricotta mixture. 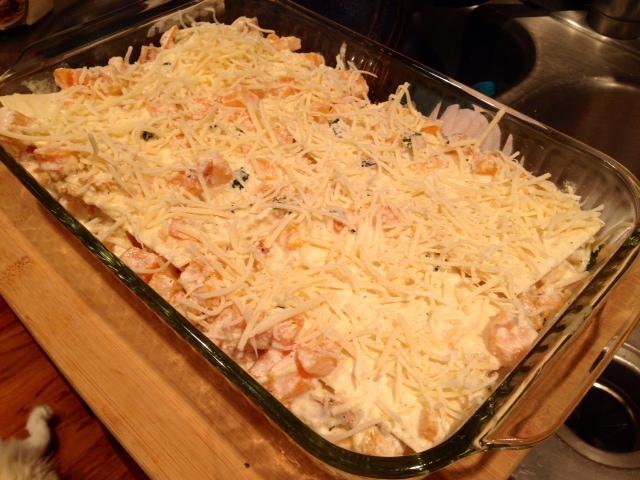 Place baking dish on a rimmed baking sheet and bake until the cheese is golden and bubbly, about 30-35 minutes. Let the lasagna stand for 15 minutes before slicing and serving, so everything can set (otherwise it’ll fall apart and be too liquid).